The United States government put forth allegations that Saddam Hussein was harboring weapons of mass destruction and had ties to Al Qaeda. As time would tell neither of these reasons for going to war were true. The Iraq War also known as Operation Iraqi Freedom, is a military engagement encompassing the invasion and occupation of Saddam Hussein's Ba'athist Iraq by a U.S.-led coalition, ongoing warfare between an insurgency and coalition troops plus the New Iraqi Army . In the midst of the fighting between the insurgency and the coalition troops, sectarian violence has erupted between the majority Shia and the minority Sunni. Following Kuwait's liberation, the UN Security Council (UNSC) required Iraq to scrap all weapons of mass destruction and long-range missiles and to allow UN verification inspections. 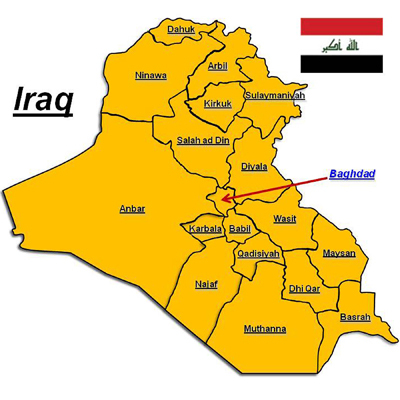 At around 0230 GMT March 20 2003, shortly after the 48-hour deadline for Saddam to quit Iraq expires, America launches its first series of air strikes on Baghdad. George Bush says the US has begun attacks against 'targets of military opportunity'. Saddam Hussein gives a televised address to the Iraqi people at around 0530 GMT, calling the attack a 'shameful crime' and vowing to win the war. China, France and Russia denounce the US-led action. At around 1805 GMT, US planes begin a heavy bombardment of military targets in central Baghdad. Later on, British marines invade the Faw peninsula in the south of the country. The invasion led to the quick defeat of the Iraqi army and flight of President Saddam Hussein, his capture in December, 2003, and his execution in December, 2006. The U.S.-led coalition occupied Iraq and attempted to establish a new democratic government. But shortly after the initial invasion, violence against coalition forces and among various sectarian groups led to asymmetric warfare with the Iraqi insurgency, civil war between many Sunni and Shia Iraqis, and al-Qaeda operations in Iraq. The financial cost of the war has been more than $806 billion to the U.S.,and over £4.5 billion to the UK. The cost will continue to rise even after the war is over -the projected total cost of U.S. veterans' healthcare and disability will run between $422 billion and $717 billion. 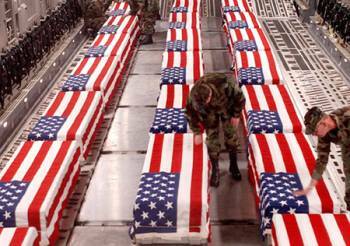 Operation Iraqi Freedom ended on August 19, 2010 with approximately 50,000 U.S. troops remaining as training troops. In a final tactical road march, the last U.S. troops in Iraq crossed the border into Kuwait, Dec. 18, 2011, signaling the end of Operation New Dawn. 1998 December - After UN staff are evacuated from Baghdad, the US and UK launch a bombing campaign, "Operation Desert Fox", to destroy Iraq's nuclear, chemical and biological weapons programmes. 1999 December - UNSC Resolution 1284 creates the UN Monitoring, Verification and Inspection Commission (Unmovic) to replace Unscom. Iraq rejects the resolution. 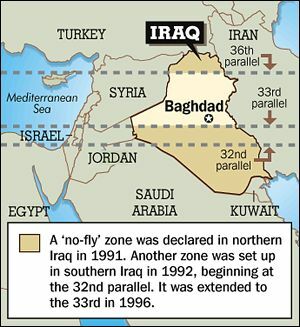 2001 February - Britain, US carry out bombing raids to try to disable Iraq's air defense network. The bombings have little international support. 2002 September - US President George W Bush tells sceptical world leaders at a UN General Assembly session to confront the "grave and gathering danger" of Iraq - or stand aside as the US acts. In the same month British Prime Minister Tony Blair publishes a ''dodgy'' dossier on Iraq's military capability. 2002 November - UN weapons inspectors return to Iraq backed by a UN resolution which threatens serious consequences if Iraq is in "material breach" of its terms. 2003 March - Chief weapons inspector Hans Blix reports that Iraq has accelerated its cooperation but says inspectors need more time to verify Iraq's compliance. 2003 17 March - UK's ambassador to the UN says the diplomatic process on Iraq has ended; arms inspectors evacuate; US President George W Bush gives Saddam Hussein and his sons 48 hours to leave Iraq or face war. 2003 20 March - US-led invasion topples Saddam Hussein's government, marks start of years of violent conflict with different groups competing for power. 2003 May - UN Security Council backs US-led administration in Iraq and lifts economic sanctions. US administrator abolishes Baath Party and institutions of former regime. 2003 July - US-appointed Governing Council meets for first time. Commander of US forces says his troops face low-intensity guerrilla-style war. Saddam's sons Uday and Qusay killed in gun battle in Mosul. 2003 August - Suicide truck bomb wrecks UN headquarters in Baghdad, killing UN envoy Sergio Vieira de Mello. Car bomb in Najaf kills 125 including Shia leader Ayatollah Mohammed Baqr al-Hakim. 2003 14 December - Saddam Hussein captured in Tikrit. 2004 March - Suicide bombers attack Shia festival-goers in Karbala and Baghdad, killing 140 people. 2004 April-May - Shia militias loyal to radical cleric Moqtada Sadr take on coalition forces. 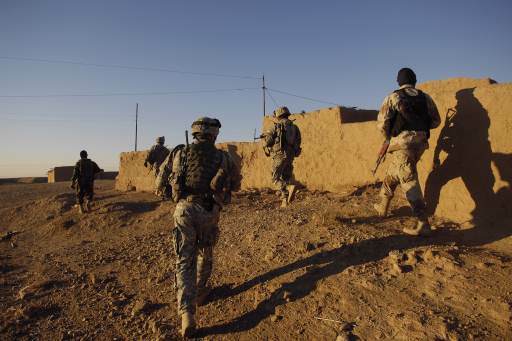 Hundreds are reported killed in fighting during the month-long US military siege of the Sunni Muslim city of Falluja. Photographic evidence emerges of abuse of Iraqi prisoners by US troops. 2004 June - US hands sovereignty to interim government headed by Prime Minister Iyad Allawi. 2004 August - Fighting in Najaf between US forces and Shia militia of radical cleric Moqtada Sadr. 2004 November - Major US-led offensive against insurgents in Falluja. 2005 30 January - Some 8 million vote in elections for a Transitional National Assembly. The Shia United Iraqi Alliance wins a majority of assembly seats. Kurdish parties come second. 2005 28 February - At least 114 people are killed by a car bomb in Hilla, south of Baghdad, in the worst single such incident since the US-led invasion. 2005 April - Amid escalating violence, parliament selects Kurdish leader Jalal Talabani as president. Ibrahim Jaafari, a Shia, is named as prime minister. 2005 May onwards - Surge in car bombings, bomb explosions and shootings: Iraqi ministries put the civilian death toll for May at 672, up from 364 in April. 2005 June - Massoud Barzani is sworn in as regional president of Iraqi Kurdistan. 2005 August - Draft constitution is endorsed by Shia and Kurdish negotiators, but not by Sunni representatives. More than 1,000 people are killed during a stampede at a Shia ceremony in Baghdad. 2005 October - Voters approve a new constitution, which aims to create an Islamic federal democracy. 2005 December - Iraqis vote for the first, full-term government and parliament since the US-led invasion. 2006 January - Shia-led United Iraqi Alliance emerges as the winner of December's elections, but fails to gain an absolute majority. 2006 February onwards - A bomb attack on an important Shia shrine in Samarra unleashes a wave of sectarian violence in which hundreds of people are killed. 2006 22 April - Newly re-elected President Talabani asks Shia compromise candidate Nouri al-Maliki to form a new government, ending months of deadlock. 2006 May and June - An average of more than 100 civilians per day are killed in violence in Iraq, the UN says. 2006 7 June - Al-Qaeda leader in Iraq, Abu Musab al-Zarqawi, is killed in an air strike. 2006 November - Iraq and Syria restore diplomatic relations after nearly a quarter century. More than 200 die in car bombings in the mostly Shia area of Sadr City in Baghdad, in the worst attack on the capital since the US-led invasion of 2003. 2006 December - Iraq Study Group report making recommendations to President Bush on future policy in Iraq describes the situation as grave and deteriorating. 2006 December - Saddam Hussein is executed for crimes against humanity. 2007 January - US President Bush announces a new Iraq strategy; thousands more US troops will be dispatched to shore up security in Baghdad. UN says more than 34,000 civilians were killed in violence during 2006; the figure surpasses official Iraqi estimates threefold. 2007 February - A bomb in Baghdad's Sadriya market kills more than 130 people. It is the worst single bombing since 2003. 2007 March - Insurgents detonate three trucks with toxic chlorine gas in Falluja and Ramadi, injuring hundreds. 2007 April - Bombings in Baghdad kill nearly 200 people in the worst day of violence since a US-led security drive began in the capital in February. 2007 August - The main Sunni Arab political bloc in Iraq, the Iraqi Accordance Front, withdraws from the cabinet following a dispute over power-sharing. Truck and car bombs hit two villages of Yazidi Kurds, killing at least 250 people - the deadliest attack since 2003. Kurdish and Shia leaders form an alliance to support Prime Minister Maliki's government but fail to bring in Sunni leaders. 2007 September - Controversy over private security contractors after Blackwater security guards allegedly fire at civilians, killing 17. 2007 October - The number of violent civilian and military deaths continues to drop, as does the frequency of rocket attacks. 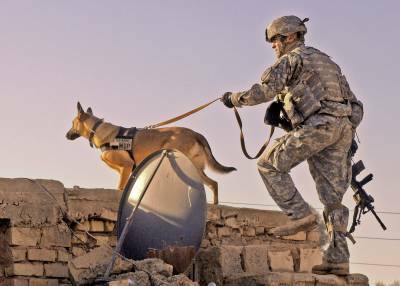 DIYALA PROVINCE, Iraq (December 27, 2007) - A U.S. Army dog handler and his dog crest the roof of a building they are clearing in Galahbia in the Diyala Province, Iraq, on Dec. 23, 2007. The handler and dog are working with the 2nd Squadron, 1st Cavalry Regiment. Photo by Petty Officer 1st Class Sean Mulligan, U.S. Navy. 2007 December - Turkey launches an air raid on fighters from the Kurdish PKK movement inside Iraq. Britain hands over security of Basra province to Iraqi forces, effectively marking the end of nearly five years of British control of southern Iraq. 2008 January - Parliament passes legislation allowing former officials from Saddam Hussein's Baath party to return to public life. Turkish forces mount a ground offensive against Kurdish rebels in northern Iraq. 2008 March - Unprecedented two-day visit by Iranian president, Mahmoud Ahmadinejad, to Iraq. Prime Minister Maliki orders crackdown on militia in Basra, sparking pitched battles with Moqtada Sadr's Mehdi Army. Hundreds are killed. 2008 July - The main Sunni Arab bloc, the Iraqi Accordance Front, rejoins the Shia-led government almost a year after it pulled out. 2008 September - US forces hand over control of the western province of Anbar - once an insurgent and Al-Qaeda stronghold - to the Iraqi government. It is the first Sunni province to be returned to to the Shia-led government. Iraqi parliament passes provincial elections law. Issue of contested city of Kirkuk is set aside so elections can go ahead elsewhere. 2008 November - Parliament approves a security pact with the United States under which all US troops are due to leave the country by the end of 2011. 2009 January - Iraq takes control of security in Baghdad's fortified Green Zone and assumes more powers over foreign troops based in the country. PM Nouri al-Maliki welcomes the move as Iraq's "day of sovereignty". 2009 February - The political bloc headed by Prime Minister Nouri al-Maliki scores big wins in provincial elections. 2009 March - US President Barack Obama announces withdrawal of most US troops by end of August 2010. Up to 50,000 of 142,000 troops now there will stay on into 2011 to advise Iraqi forces and protect US interests, leaving by end of 2011. 2009 June - US troops withdraw from towns and cities in Iraq, six years after the invasion, having formally handed over security duties to new Iraqi forces. 2009 July - New opposition forces make strong gains in elections to the regional parliament of Kurdistan, but the governing KDP and PUK alliance retains a reduced majority. Masoud Barzani (KDP) is re-elected in the presidential election. 2009 October - Prime Minister al-Maliki announces the formation of a new political grouping of 40 parties, called the State of Law, after a split in the broad Shia United Iraqi Alliance that won the 2005 elections. Two car bombs near the Green Zone in Baghdad kill at least 155 people, in Iraq's deadliest attack since April 2007. 2009 December - The al-Qaeda-linked Islamic State of Iraq claims responsibility for a wave of suicide bombings in Baghdad that leaves at least 127 people dead, as well as attacks in August and October that killed 240 people. Tension flares with Tehran as Iranian troops briefly occupy an oilfield in Iraqi territory. 2010 January - Controversy as candidates with alleged links to Baath Party are banned from March parliamentary polls. A court later lifts the ban, prompting a delay in campaigning. "Chemical" Ali Hassan al-Majid, a key figure in Saddam Hussein's government, is executed. 2010 March - Parliamentary elections. No coalition wins enough votes for a majority in parliament. 2010 April - Amnesty International says political uncertainty has led to an upsurge in violence. 2010 August - Iraq's top army officer criticises planned US troop withdrawal as premature. He warns that Iraqi military might not be ready to take control for another decade. Five months after the elections, Iraq's two main political blocs suspend talks on forming a government. Seven years after the US-led invasion, the last US combat brigade leaves Iraq. 2010 September - Syria and Iraq restore diplomatic ties a year after breaking them off. 2010 October - Whistleblowing website Wikileaks publishes thousands of classified US military logs on the war in Iraq. Church in Baghdad seized by militants. 52 people killed in what is described as worst single disaster to hit Iraq's Christians in modern times. 2010 November - Parliament reconvenes after long delay, re-appoints Jalal Talabani as president and Nouri al-Maliki as prime minister. 2010 December - Parliament approves a new government including all major factions, ending nine months of deadlock after inconclusive elections. Some key ministries remain unfilled because nominees could not be agreed. 2011 January - Radical Shia cleric Moqtada Sadr returns to Iraq after nearly four years of self-imposed exile in Iran. 2011 February - Oil exports from Iraqi Kurdistan resume, amid a lengthy dispute between the region and the central government over contracts with foreign firms. Several people killed in nationwide protests similar to unrest sweeping the Middle East. Administration of Iraqi Kurdistan is also targetted by protests calling for reform and an end to corruption. 2011 March - Iraqi Kurdistan moves troops into position around disputed city of Kirkuk, raising tension with central government. 2011 April - Army raids camp of Iranian exiles, killing 34. Government says it will shut Camp Ashraf, home to thousands of members of the People's Mujahedeen of Iran. 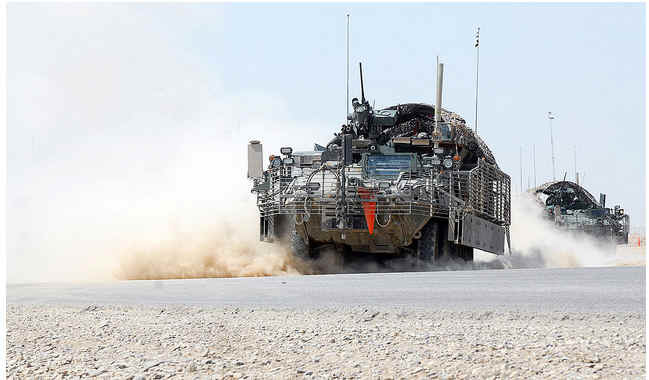 WASHINGTON, Aug. 20, 2010 – The redeployment of the 2nd Infantry Division’s 4th Stryker Brigade Combat Team from Iraq demonstrated the changes that have happened in the country, the brigade’s commander said today. In a telephone interview from Kuwait, Army Col. John Norris spoke about the unit’s road march from Baghdad to Kuwait. The extensive media coverage of the unit’s departure from Iraq was a tremendous honor for his soldiers, Norris said, but some of the focus on the brigade being the last full combat brigade out of Iraq ignores the real situation. “There’s still a significant amount of work to be done, and these guys with the ‘advise and assist’ brigades remaining here have enormous capability and enormous capacity and will be able to work with Iraqi security forces,” the colonel said. The spin from the media was that this was the end of the mission, Norris said. “We do not want to shadow the capability that remains in Iraq: 50,000 soldiers in advise-and-assist units is a large signature that will allow Iraqi forces to improve,” he said. The Stryker brigade was based in western Baghdad and worked daily with Iraqi security forces in that key area. At one time, the area was a dividing point between Sunni and Shiia Muslims, and literally was a tinderbox. But the unit -– based at Joint Base Lewis-McChord, Wash. -- found an increasingly permissive environment as its deployment went along. 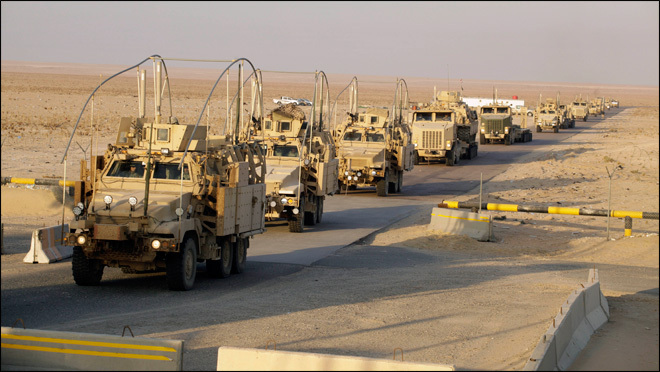 U.S. Army Stryker vehicles of the 4th Stryker Brigade Combat Team, 2nd Infantry Division, travel through Contingency Operating Base Adder during the unit’s convoy from Baghdad to Kuwait, Aug. 18, 2010. U.S. Army photo by Pvt. Deangelo Wells. During that time, the Iraqi security forces made tremendous progress, Norris said. The unit marched out of Iraq to give the U.S. commander in Iraq, Army Gen. Raymond T. Odierno, more options, Norris said. “As a part of the responsible drawdown of forces, our brigade would have started redeploying in July in a phased approach,” Norris explained. But the Iraqi parliament -– elected in March -– still had not formed a government. The brigade staff looked at the situation and made a recommendation that the brigade stick around and march out, Norris said, enabling the brigade to stay somewhat longer to provide a strategic force for the command. Once the decision was made, the tactical road march was planned. The brigade was spread out all over western Baghdad, and the mission was to get 2,200 soldiers in 350 vehicles out of the area. The 350-mile road march would be a tempting target for al-Qaida in Iraq or other terror groups. Planning included the American commands in Iraq and Kuwait. It also included Iraqi security forces. “We moved from Baghdad and did a rest overnight at Camp Adder [in Talil, Iraq] and then moved south to Kuwait,” Norris said. “It was a good plan, and it went flawlessly. I couldn’t be more proud. There was no enemy contact and very few maintenance issues – flat tires and all recovered by us. “We were able to move all four of our serials into Kuwait as originally scheduled, with the last crossing into Kuwait on the morning of the 19th,” he continued. Norris called it “a pretty awesome experience” for him as a commander to realize the unit completed its year-long mission with all the soldiers safely into Kuwait. The unit will case its colors tomorrow morning and begin the flight back to Joint Base Lewis-McChord early next week. WASHINGTON, Aug. 19, 2010 – A fundamental shift will take place at the end of the month in the mission of U.S. forces in Iraq, a Pentagon official said today. The change in mission from Operation Iraqi Freedom to Operation New Dawn reflects the improvement in conditions in Iraq and will officially end the U.S. combat mission in Iraq and change it to one of stability operations, Pentagon spokesman Bryan Whitman said. Though the “advise and assist” mission does not officially change until the end of the month, American brigades have been in place and performing that mission for more than a year in southern Iraq and now through almost all of the country. “As a practical matter, we have now been conducting stability operations for the last several months,” Whitman said. Six U.S. Army brigades – plus support personnel – will work with Iraqi security forces through the end of 2011, when all American troops will be out of Iraq. The units are the 1st, 2nd, 3rd and 4th brigades of the 3rd Infantry Division, the 3rd Brigade of the 4th Infantry Division and the 2nd Brigade of the 25th Infantry Division. Soldiers with these units will be advising, assisting, teaching and mentoring the Iraqi army and police in a range of capabilities. U.S. Air Force personnel will continue to help in training the Iraqi air force, and Navy and Coast Guard personnel will continue to advise and assist Iraq’s maritime forces. President Barack Obama has indicated that the mission will officially change on Sept. 1, and military forces and U.S. civilians in Iraq are moving to reflect that. While instances of violence have dropped dramatically in Iraq, dangers still exist there. U.S. forces always maintain the capabilities to defend themselves, Whitman said, and will retain that right even after Sept. 1. American “advise and assist” units will have the capabilities to come to the aid of Iraqi security forces if called upon, he added. WASHINGTON, Aug. 19, 2010 – With the last full brigade of combat troops now out of Iraq and another 6,000 U.S. forces to leave by the month’s end, the mission in Iraq continues with the transition to stability operations, Army Maj. Gen. Stephen R. Lanza, spokesman for U.S. Forces Iraq, told reporters today. The final convoy of combat troops, members of the 2nd Infantry Division’s 4th Stryker Brigade, crossed into Kuwait before dawn today. “With that brigade that just left, we’re roughly a little under 56,000 [troops],” Lanza said. That number, he said, will steadily decrease within the next 12 days to meet President Barack Obama’s mandate. “And on 1 September, we’ll transition to stability operations as part of New Dawn,” Lanza added. In addition, U.S. forces will continue to help the Iraqi security forces build capability and capacity until the U.S. mission in Iraq ends in December 2011. “We’ll continue to train, coordinate, advise and assist them in accordance with the security agreement,” Lanza said. Lanza expressed confidence in the Iraqi security forces, now numbering more than 660,000, and pointed to examples of their success. “They have shown they can secure the country for the elections. They have shown they can secure the country for major religious holidays,” he told CBS. Lanza told CBS he’s also impressed that Iraqi security forces have remained apolitical while the Iraqi government undergoes its transition. Lanza expressed hope the Iraqi government gets seated soon, mitigating recent incidents of violence. As Operation Iraqi Freedom winds down and Operation New Dawn prepares to launch Sept. 1, Lanza said the continuing U.S. mission in Iraq is enabling Iraq to move forward. KUWAIT CITY, Dec. 14, 2011 – As the last 5,700 U.S. troops leave Iraq to govern itself as a sovereign nation, the best way for the United States to support that country’s success is to stay broadly engaged in the region, the chairman of the Joint Chiefs of Staff said today. As part of his first USO holiday tour as chairman, Army Gen. Martin E. Dempsey landed at dawn at Kuwait International Airport, traveling with his senior enlisted advisor, Marine Corps Sgt. Maj. Bryan B. Battaglia, their wives, and celebrities arriving to entertain the troops. “The exit from Iraq is not an exit from the region,” Dempsey told reporters just before the USO show at Camp Buehring, one of three remaining staging posts for troops and their equipment in northwestern Kuwait. “The best way to ensure Iraq has the kind of future we all want for it is to stay engaged broadly,” the chairman said, adding that the Strategic Framework Agreement, signed by the United States and Iraq in 2008 to establish long-term bonds of cooperation and friendship, directed that the relationship be built through mutual interests in security as well as trade, education and culture, law enforcement, environment and energy. Dempsey’s thoughts about Iraq and its future arise from years of experience there. In 1991 he deployed with the 3rd Armored Division in support of Operation Desert Storm, a war waged against Iraq by a U.N.-authorized, U.S.-led coalition force representing 34 nations in response to Iraq's invasion of Kuwait. In June 2003, Dempsey took command of the 1st Armored Division in Baghdad and served there for 14 months. In 2005 he returned to Iraq for two years to train and equip the Iraqi security forces as commanding general of the Multinational Security Transition Command–Iraq. “Based on the [Iraqi] security forces’ … ability to manage their internal security threats, I think they’re on a very stable platform,” he said. “That needs to continue to develop,” the chairman added, noting that they have work to do on building some of the architectures that define stability. “They have and will continue to work on air sovereignty, intelligence architectures, logistics architectures and the training and education component,” Dempsey said. The United States will offer Iraq support through an Office of Security Cooperation, established to help Iraqis acquire and then learn how to use military equipment they buy from the United States. In Iraq that office will include 157 people assigned to the U.S. embassy and under the authority of the ambassador, and some who might come in on individual contracts for two or three months at a time to help the Iraqis train on U.S. equipment. Having spent three years in Iraq working to help the leadership establish their own stability and build their own capabilities, Dempsey said the goal always was to help Iraq become a stabilizing influence in the region. “We always thought they had the potential to do that,” he added, with their economic strength, rich cultural history, good education system, agricultural development and water resources. Dempsey said the intense effort to move troops out of Iraq, prompted by President Barack Obama’s Oct. 21 announcement of the 2011 end-of-year deadline, delayed the emotional impact of the reality. “The truth is I only found myself thinking about that in … the last 24 hours,” he said. In those moments, he said, “I reflected on the fact that this has been a 20-year journey for me” and others who were part of the conflict with Iraq that began in 1990. Dempsey said he’s proud of what U.S. military forces and others did in 1991 in Iraq and what U.S. forces have done over the past eight years. “I think we’ve given Iraq an enormous opportunity,” he said. WASHINGTON, Dec. 14, 2011 – When the last U.S. troops in Iraq case their colors and move to Kuwait, they can leave with their heads held high, secure in the knowledge they did what was right for America and peace in the region, President Barack Obama told service members at Fort Bragg, N.C., today. Obama noted the end of the war in Iraq during his speech to thousands of service members -- many of whom served multiple tours in Iraq since 2003. The most important lesson from the war in Iraq is about America’s national character, Obama said. That fact is why the American military is the most respected institution in the country, the president said. The young men and women at Fort Bragg represent more than 1.5 million Americans who have served in Iraq. More than 30,000 Americans have physical wounds from the conflict with tens of thousands afflicted by unseen wounds like traumatic brain injury and post-traumatic stress. This 9/11 generation has earned its place in history, the president said. “Because of you, because you sacrificed so much for a people that you had never met, Iraqis have a chance to forge their own destiny,” he said. “That’s part of what makes us special as Americans. Unlike the old empires, we don’t make these sacrifices for territory or for resources; we do it because it’s right. And U.S. service members in Afghanistan are taking on the Taliban and breaking the back of al-Qaida, the president said. Today’s service members enlisted during a time of war knowing that they’d be the ones who went into harm’s way, Obama said. And they will remember that they were touched by fire, and can be proud they answered the call, the president said.